A Dell Chromebook is a lightweight and elegant laptop which utilises the flexibility of Googles Chrome internet technologies. Its systems are built with app and cloud technology in mind and offer an affordable and practical way to access and manage information. Students, and their parents, are particular fans of the Chromebook thanks to the unit’s durability up against pressure, temperature, humidity, shock and vibration. This is mostly due to the rubberised LCD and base trim which can handle knocks and shocks better than other systems on the market. Some Dell Chromebook models also boast toughened screen glass and the best spill protection around. The design of a Chromebook also holds its own in the crowded laptop market. You can choose a decent-sized screen of around 12 inches while still benefitting from the lightweight practicality of a unit that weights under 1.5kg. This means a Chromebook is well-equipped to handle the stresses of work or study and can be easily transported through a bust day. Many models also sport a 180-degree LCD hinge which allows for easy adjustment and improves resilience. As much as these systems are designed for work, there is also scope for a Chromebook owner to play. Most models are fitted with a good quality microphone, and speakers, which suit online chat or other leisure uses. It’s easy to adapt the Chromebook to any of these uses thanks to the easy access it offers to thousands of apps via the Chrome Web Store. In terms of performance, a Dell Chromebook runs off an Intel Celeron processor so it can respond quickly and easily to whatever is thrown at it. It will boot quickly when you turn it on, and as it’s designed with the internet in mind, it offers almost instant access to internet pages using the Chrome browser. Choosing a Chromebook also offers the reassurance of an excellent battery life (some models offer up to ten hours between charges), and the peace of mind that comes from its automatic scanning for security threats when you add new apps. The system will also update itself without prompting to track emerging threats that could slow the performance of your system or put your information at risk. 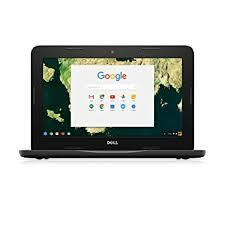 We are always watching the market for new deals and offers so if you can’t find the Dell Chromebook you are looking for then get in touch to enquire. We’re proud to offer fast delivery and customer service you won’t fail to be impressed with.